Hi Friends! Back to reality after Spring Break, womp-waaaaahhhh. But that’s okay, we had a GREAT spring break (will share a post soon! ), and I think the kids are actually excited to get back to school and gt back to soccer! But still, I am anxious for summer to be here!! I love these types of bowl dinners- whether they are burrito bowls, ramen bowls, salad bowls, or whatever. The grain base, a protein, and lots and lots of veggies and some sort of sauce or dressing. They are so good and so easy, and also perfect for picky kids, because you can customize them however you like with whatever you like! 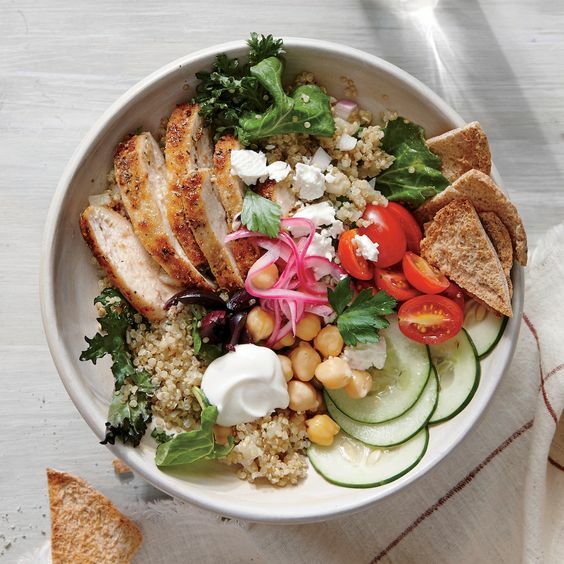 I thought this Greek-inspired Chicken Gyro bowl sounded so good, since we love Greek salads and all the accouterments. I have said before how much I love The Pioneer Woman’s recipes, and this one is no exception! 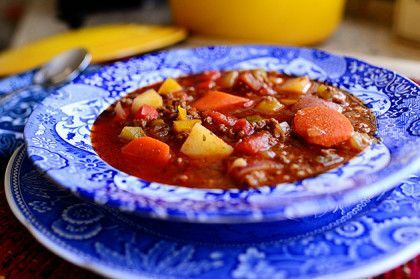 A very simple and comforting Hamburger Soup with carrots and potatoes, and it is just delicious. I love making soup and eating the leftovers for lunch after the flavors really develop and taste even better. The leftovers never last long when I make this one! 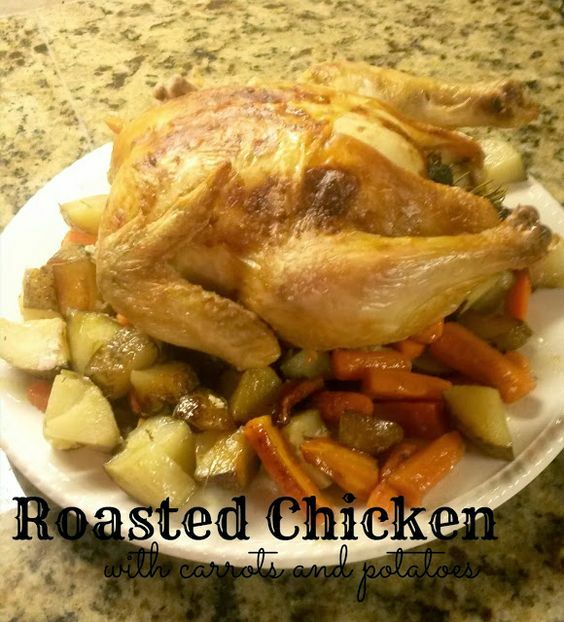 Easy, cheap, and SO GOOD, roasted chicken can seem scary, but it really is very simple to make! The rule of thumb that I always go by, is cooking your chicken 20 minutes per pound. So a small 3-pound bird will roast for an hour. If you stuff the carcass with herbs, lemon, onions, and then stuff butter and herbs between the skin and the meat? You can’t lose. We were watching the Pioneer Woman’s cooking show the other day when she was making these black bean burgers, and surprisingly, Scott mentioned how good they looked and how good they would be for dinner. I wouldn’t have expected him to say that, being the “meat and potatoes” kind of man he is, but I took it as an opportunity to try it out! So I cannot wait to try these black bean burgers. And we have eaten this Mexican chopped salad in the past, and it’s delish. Fresh corn, tomatoes, onions, more black beans (plenty of non-meat protein in this dinner! ), cukes, etc., and with a lime cilantro vinaigrette, it’s so good. And that’s all I have planned for the week! We have lots of Zucchini and Mushroom Risotto left over from the weekend (watch me and Gracie cook it up from Sunday on Snapchat-my username is goatadlulu), and I’m banking on some leftover soup and other veggies and leftovers for a smorgasbord kind of a leftovers night one night this week (did anyone else read the Babysitters Club books, and one of them, maybe Stacey?? had a smorgasbord dinner night with their family where they just took everything out of the fridge and ate whatever they each wanted? I always thought that was genius and so fun!). Hope you have a great week, and I’d love to hear what you’re making for dinner this week!